Once again, we were challenged to give a face to the yearly publication issued on the occasion of the anniversary of the University of Minho. 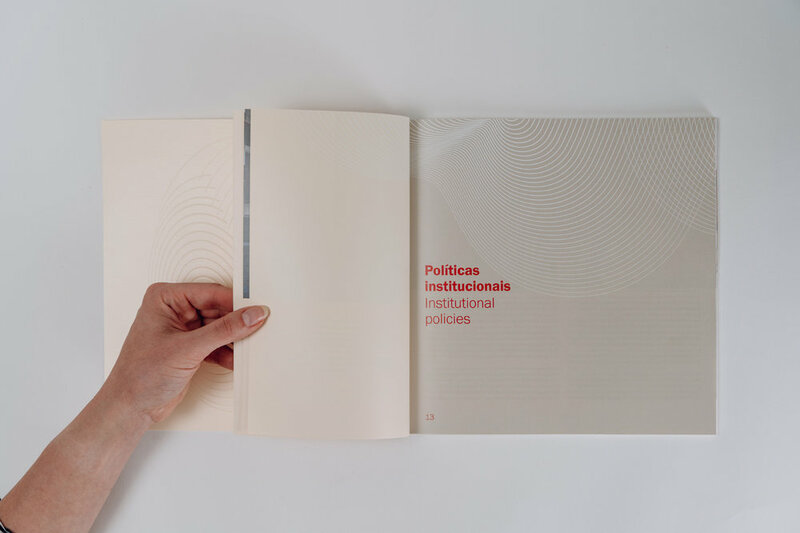 This year’s Revista UMinho explores the theme of interaction between the university and society, in its different modes and effects. The University of Minho presents itself as a “promoter of economic, social and cultural development” and it’s characterised by a strong bond with its surrounding environment, thereby plays an active role in reshaping it. The cover aims to reflect the mark that UMinho’s leaves on the community through the projects and actions it promotes. For that, there seemed to be no better way to represent the metaphor of a fingerprint than through the application of blind embossing. 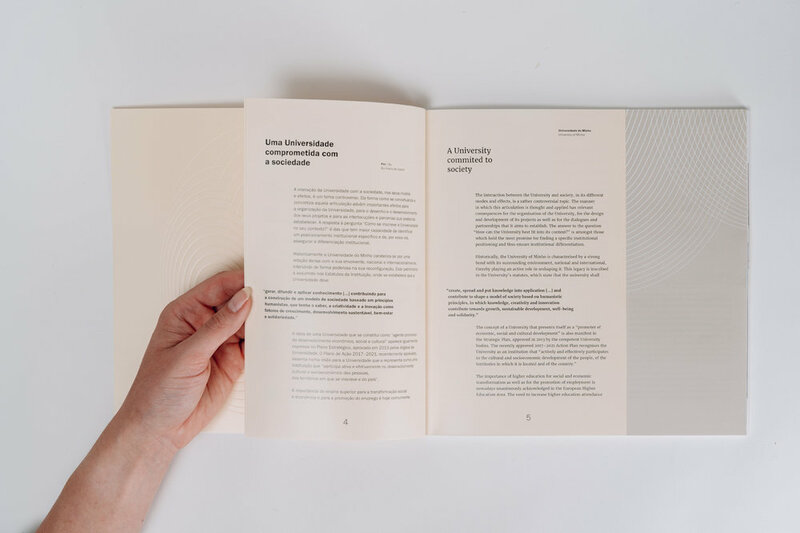 The magazine inner pages are divided into three parts, where each has been assigned a slightly different tone of voice expressed through a somewhat different layout, as well as the type of paper and—in case of the editorial part—also a different page size. Revista UMinho is a yearly publication issued for the anniversary of the University of Minho. This year’s edition (2017) was created under the theme “Chão aberto a quem chegar” (“Open Ground to Those Who Come”)—a verse from the lyrics of the University’s hymn. We were challenged to find means to represent through the look and feel of the piece the openness of the institution—the eagerness and flexibility to meet any expectations of the newcomers. What if there was a door, one that never closes? 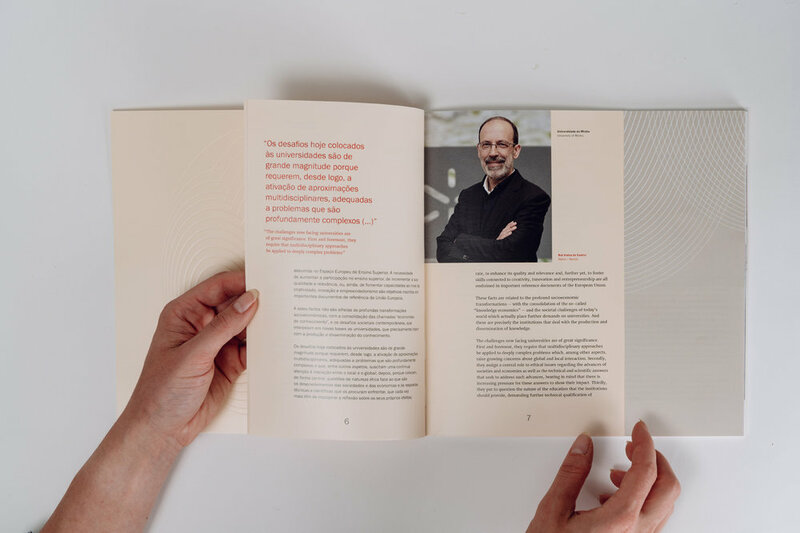 We designed the magazine with a cut through—a square-shaped aperture in the middle of the piece, which carries throughout each and every page. The negative space is an integral element of the object. It takes an active part in interaction with the booklet, too. The matt paper we chose for the cover of a warm grey shade, and texture of fine sand (Andina Grey from Curious Matter collection). It resembles the architectural structures of the university, while the warm red clay colour (used inside) symbolises the people. The special transparent bookmark features additional information about the anniversary, and when in place it reveals the UMinho logo inside the opening.